Zach was born in Southern California but has called Florida home since high school where he attended IMG Academy in Bradenton. After high school he lived in England, Slovakia, and Germany before attending college in Indiana. He graduated with a business degree in Entrepreneurship & Innovation with a minor in German from Butler University. He was drafted 8th overall to the Houston Dynamo of Major League Soccer where he was also a licensed real estate agent. 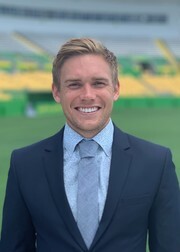 Zach currently plays professional soccer for the Tampa Bay Rowdies. Zach has always had a passion for real estate being raised in a family of “House Flippers". He will provide you with the same relentless work ethic and determination that has brought him so much success on the soccer field to make sure you are 100% satisfied in buying or selling your home.